Femme Hub | Be Dark Skinned. Be Beautiful. Be Proud. Black is beauty. Black don’t crack. Black is pride. So why do so many women want to bleach out their beauty? The debate as to why dark skinned women want to fit into the pale skin mould is ongoing and seemingly never ending. The dangers have been highlighted and disastrous results are there for all to see. Still, black women interfere with their skin pigmentation to fit into the light skin society. How did this mindset that may very well be traced to the days of slavery creep into modern times and worse still to the custodians of beautiful black skin? What informs an otherwise beautiful woman to alter her skin colour? The need and extent to which women are messing with their pigmentation is both worrying and baffling, more so here where dark skin is predominant and we’re not necessarily discriminated against or oppressed for our skin colour. The skin bleaching phenomenon is so widespread and is feeding a whole line of businesses in both up market as well as dingy downtown salons, boutiques and shops. A lot of these concoctions will only give temporary results and so users will have to keep going at it again and again. This means feeding your skin and body more and more of these combinations of dangerous compounds that should otherwise not be anywhere near the human body. These chemicals can cause skin thinning, hyper pigmentation, and permanent skin damage. Overuse of some products of these products can go as far as causing skin cancer, internal organs damage and even birth defects. Bleached out skin is not necessarily beautiful skin. In most cases, due to harsh chemicals that women are using, it is weak translucent skin with prominent green veins underneath and blotches in parts especially elbows, ankles and finger knuckles and sadly, smack on the face that you seek to make beautiful. Besides, bleached out skin ages really badly. Find a dark skinned person you admire and have them as your role model. 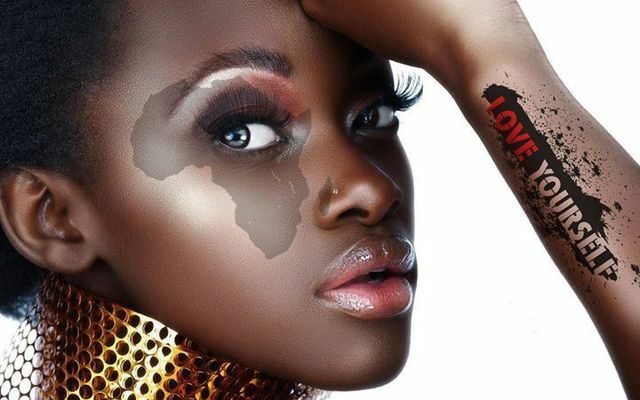 It is obvious throughout history and recently in the case of Lupita Nyongo and many other successful people that black skin has never stopped anybody from raising to the top. Rather, it is negativity towards it that does. Buy make up in your hue so that you can hide whatever undesirable aspects of your face you don’t like. It could be after marks of previous acne attacks that you’re trying to clear out with harsh chemicals, or it could be uneven skin tone. First of all, skip the harsh chemicals and talk to a specialist about sorting out your skin conditions in a safe and controlled manner. In the meantime make use of reliable powders and concealers that are make specifically for our kind of skin. You may think that it’s just a matter of buying a cream and applying it on your face but wanting to change your skin colour could and indeed does have deeper under-laying courses. Take a deep look at yourself and why your natural skin colour is making you feel inferior. Keep intellectual company that does not put you on the spot about being dark, but rather looks at life in terms of more helpful things. Talk to a loved one and if need be a psychiatrist who’ll help you unearth and deal with any self esteem issues that may be plaguing you. You might be surprised to find that skin colour was not a problem after all. Look around you, there’s black happy skin everywhere! Be Dark Skinned. Be Beautiful. Be Proud.